I‘ll bake you a cake, yes. But you should know that it will likely be a recipe I invented the same day, and its debut for you will be its raison d’être. 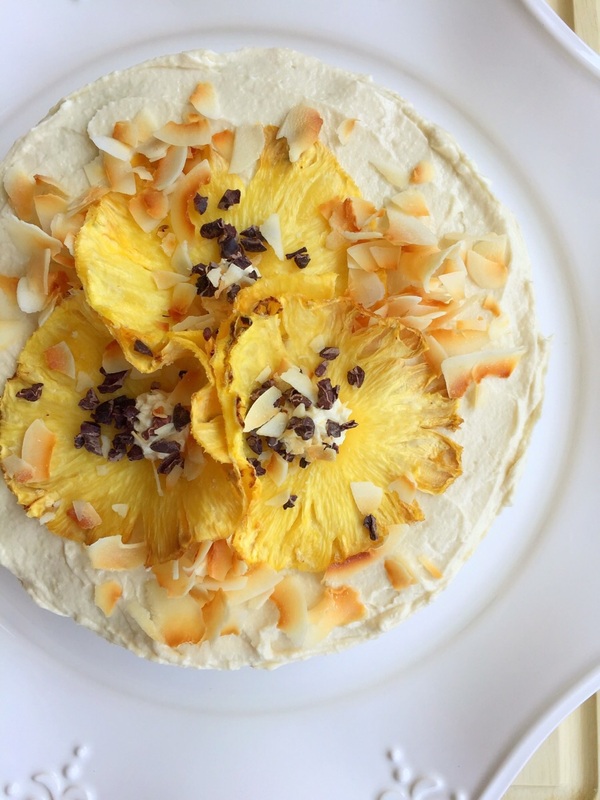 That’s certainly the case with this Pineapple Dreams Coconut Cake. I invented it for a birthday, and named it the way I did because it totally the stuff of dreams if you’re a tropical pineapple lover. Nibbling the last little sliver at the party was the first time I tasted this cake… after I served it to everyone else, hoping for the best. Luckily, this little looker of a coconut cake was devoured in minutes among eight people, with a few jockeying for seconds. It has the taste of sweetly beachy excitement, with a firm, damp crumb and an ingredient list that makes no apologies. Grain-free, nut-free, dairy-free and sweetened with honey, but this cake doesn’t smell of substitution. It is its own self, and a creamy, dreamy, golden, sun-kissed one at that. One note about presentation: this cake is warmly yellow inside, coconut flour stained gold by crushed pineapple, honey, and egg yolks. I used a variation of my favorite frosting recipe to coat its surface, then piled on toasted coconut flakes… and when I saw a lovely piña colada “ice cream” cake decorated with dehydrated pineapple slices, I knew I had my finishing touch. I don’t have a dehydrator (seriously, who does?) so I was happy to see that the technique makes use of a regular ol’ oven. I piped a wee droplet of frosting into the center of each dried pineapple slice, and sprinkled a few cacao nibs for a pop of rich bitterness to temper the sweetness. If you prefer to skip the added step of drying your coconut slices at home, use store-bought dehydrated pineapple or apple rings and all will be well. 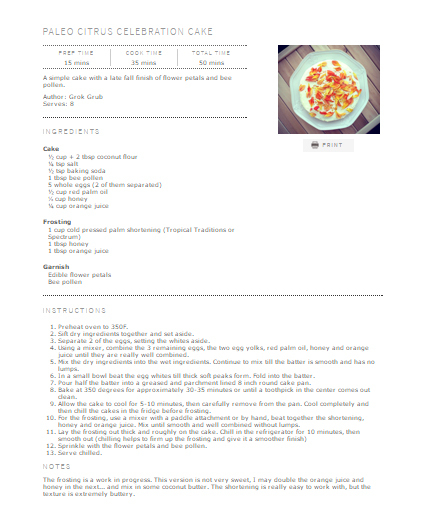 Note: this is a rework of an earlier recipe of mine called Citrus Celebration Cake. Original recipe can be found here. 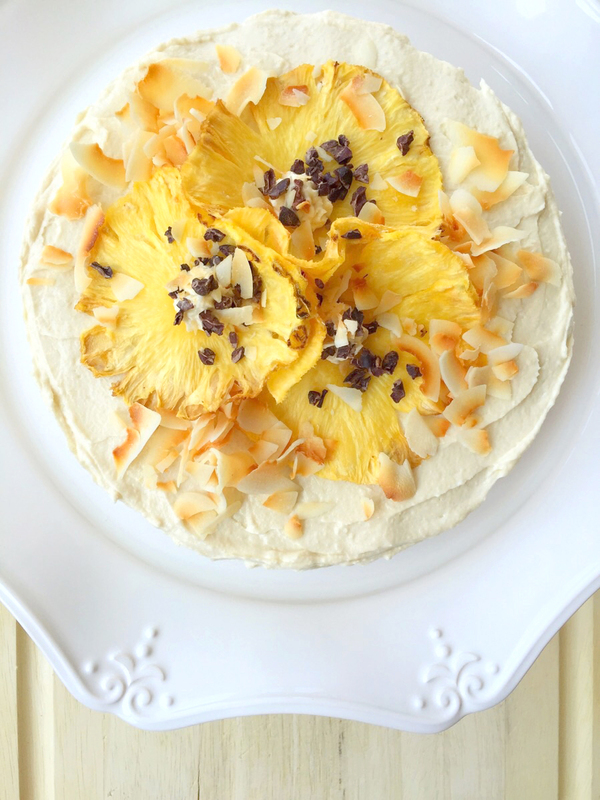 A slice of this Dreamboat Pineapple Coconut Cake is the taste of a tropical paradise on a plate. Preheat the oven to 350° F. Grease a round 8" cake pan with coconut oil, line with parchment paper, and set aside. Whisk the coconut flour, arrowroot flour, baking soda and salt together in a medium mixing bowl. In a blender, combine the crushed pineapple, honey, coconut oil, vanilla extract and eggs until smooth. Gradually fold the wet ingredients into the dry, mixing the batter until there are no lumps. Spoon the mixture into the prepared cake pan, smooth the surface with the back of a spoon and then bake in the preheated oven for approximately 40 minutes or until a tester inserted comes out clean. Remove from the oven and set aside to cool while you prepare the frosting. Using a hand mixer, whip the frosting ingredients in a small mixing bowl until very smooth. Once the cake has cooled, remove it from the pan and frost the top and sides with a butter knife or specialty frosting spreader. To make the dried pineapple rings, preheat the oven to 170° F. Cut away the rough exterior of a fresh pineapple, then slice into very thin rings. Lay the rings on a silicone baking sheet or wax paper-lined baking sheet and bake in the oven for 2-3 hours or until the rings are dried and browned on the edges. Press the pineapple rings together in the center of the frosted cake. Spoon or pipe a dollop of frosting in the center of the pineapple rings, then sprinkle toasted coconut flakes and cacao nibs over and under the pineapple slices as preferred. All my favorite pina colada ingredients in a cake! Brillant! Although this also has the tiniest bit of (optional) chocolate. Winning! Can this be cooked in a bundt pan? I just won a fabulous 70th anniversary Nordic Ware bundt pan and want to make this for Easter. I haven’t tried in a bundt pan before… it would definitely affect the cooking time. Try 30 minutes instead of 40. Wow – this is absolutely gorgeous! A work of art! Thank you, I wanted it to look as good as it tastes! I am so going to try this recipe. Your post is making me hungry. Mmm, that looks amazing. Totally pinning this. OMG…. This looks so delish… I will share this post with my mom who loves to bake. I’m so happy I found your post…. Awesome Sauce!!! This looks so great! I kind of wish there was a picture of the inside of the cake to see how the “meat” of the cake looks. Anyways, beautiful cake and beautifully written. Wow! That is one gorgeous cake! I’ve pinned this to my personal Pinterest account. I think this cake recipe should work for those of us trying to do Trim Healthy Mama. Thank you for sharing!!! Interesting! I’ll have to look that up. The cake is gorgeous, and your description has me drooling on my keyboard! LOVELY!!! Coconut and pineapple, my two favorite things! Definitely bookmarking this for future reference! This is seriously too pretty to eat! Who am I kidding.. I’d devour it haha. I LOVE coconut anything! Me too, and I especially can’t get enough of coconut cake! This cake is beautiful! Your dreamboat is a lucky man. Wow, what a beautiful cake. it looks too good to slice. What a beautiful cake and I love how you described the taste. You make me want a slice right now! Have you tried making two layers? Or another option (to feed more people) do you think one could double it and bake as a sheet cake (9×13)? I think the easiest thing would be to make two layers, but if you did bake it as a sheet cake, you may have to adjust baking time a tad. Let me know how it goes! How did you like it?! You citrus celebration cake links to this? Not sure why! But trying to find the citrus cake recipe, help! I was tested for food sensitivities and found out I can not eat honey. Do you think I could replace the honey with maple syrup, or do you think a coconut sugar would be better? Also, would I have to adjust liquid/baking times if I substitute with maple syrup? Also, I made a paleo bread once that had a lot of arrow root powder in it and it ended up being hard as a rock, so this is kind of a concern of mine with this recipe as there are only 4 eggs in it and 1/2 cup of coconut flour as well. I think maple syrup with work well, but your cake and icing will be darker in color. No need to adjust anything if just a straight substitution of maple syrup for honey… and as for your concern about only four eggs with 1/2 cup coconut flour: it’s important to consider the other liquid ingredients at play here (oil, liquid sweetener) which help moisten the dry ingredients. Hope this helps! Thank you! I’m going to try it this weekend as we’re having friends over for dinner. I’ll let you know how it turns out! Fingers crossed you dig it! do you drain the pineapple? and what liquid is there or is it just the 4 eggs? Has anyone tried making this up ahead of time? I have family coming over for easter but am trying to do the majority of the cooking on Saturday as they are coming into town Saturday night. I know it says to serve room temperature but I didn’t know how it would do sitting out for a day before being eaten. Thoughts? Hmmmm, unfortunately I don’t think it would do well made beforehand. Would get soggy! Do you drain the crushed pineapple? Also, has anyone tried freezing the cake? Absolutely drain the crushed pineapple. Also, I’m not sure if anyone has tried freezing it… I know I haven’t yet.